The Preakness Stakes, held each May at Baltimore’s Pimlico race course, offers a weekend of world-class thoroughbred racing in pursuit of the coveted Triple Crown. Winning all three of the races — the Kentucky Derby, the Preakness Stakes and the Belmont Stakes — is considered the greatest accomplishment in thoroughbred racing. While the eyes of the world turn to equestrian competition this spring, horses are front and center in Carroll County all year around. 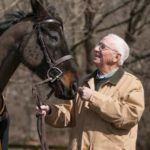 Carroll County has its own horsing legacy, and love for the animal and sport are woven into the very fabric of Carroll County. Carroll County’s pride in the horse industry dates back to the late 1800s. A legendary horseman from New York City, Robert Wyndham Walden, is at the center of local horse folklore. He is famous for a career in which he produced winners of the Preakness, Kentucky Derby and Belmont Stakes for horse owner and tobacco magnate George Lorillard. Walden also won the Preakness race with a horse of his own, Refund. Carroll County landed on the horseracing map with Walden’s relocation to the county in 1878. He established Bowling Brook stables, near Middleburg, for thoroughbred training. Carroll County landed on the horse map in more recent times with one of the world’s top standardbred stallions, Goo Goo Gaa Gaa. The horse is owned by Westminster breeder and trainer Richard Hans. Standardbreds race by pulling small carts, called sulkies. Goo Goo Gaa Gaa won 15 career starts, earning more than a half-million dollars and setting a track record. Horses not only attract the national limelight, but they also contribute to the economic landscape in Carroll County. Shamrock Farm is Carroll County’s leading thoroughbred racing farm, located on about 640 acres in Woodbine. 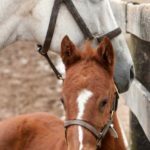 A typical day on the farm starts with stallions and mares mating and can end with the arrival of new foals birthed by farm horses. James Steele, farm manager, knows firsthand how horse farms benefit the local economy. “Right here in Carroll County, the economic impact is quite strong,” he said. He points to the fact that there are numerous farms that board horses and provide recreational and sporting horse activities. “Income is generated by farmers who raise hay and straw, salesman who provide feed for horses, veterinarians, farriers who treat the hooves of horses, and other specialists who keep the horse industry running. I could write a book about the abundance of economic opportunities we have in Carroll County,” Steele said. 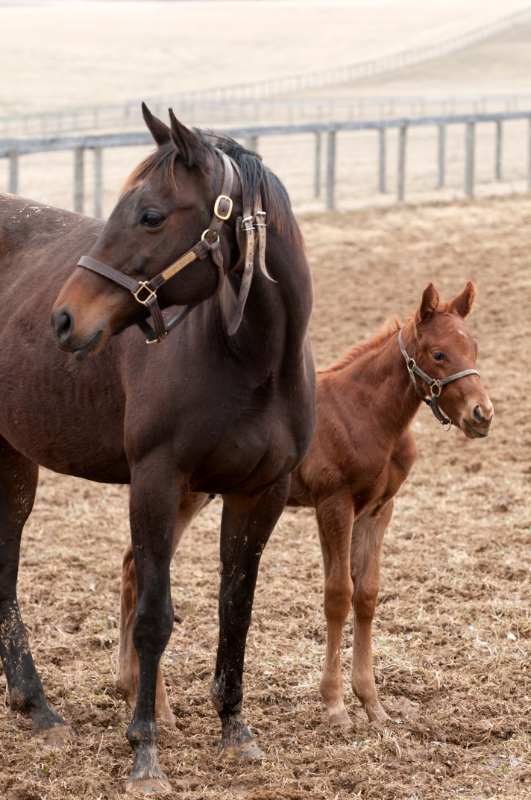 According to several state agencies, Carroll County has the fifth-largest equine inventory in the state, with a value of more than $30 million. There are more than 1,700 equine places in Carroll, resulting in more than 18,000 acres used for equine activities. Equine-related capital expenditures in Carroll — for the purchase of horses, equipment and real estate — is more than $9 million. Horses are fun, but they are also an economic driver. In addition to helping support a healthy economy, horse farming also helps build healthy families. Shirley’s grandfather was a commissioned officer of Maryland National Guard Troop A and first commander of the cavalry troop that served as the security force during the Great Baltimore Fire of 1904. In addition, Shirley’s father was one of two prominent Clydesdale breeders in the state and a Maryland State Fair superintendent. Shirley has a 40-acre farm near Winfield. He raises horses and hay, and trains thoroughbreds, for which his daughter is prominently known. He and his son also have strong ties to the Maryland State Fair. Sharon Dawson and her husband own Darenth Farm in Mount Airy. The farm is located on about 45 acres and has 18 horses. 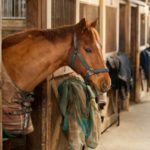 The farm offers lessons, summer riding and swim camps, and horse boarding. 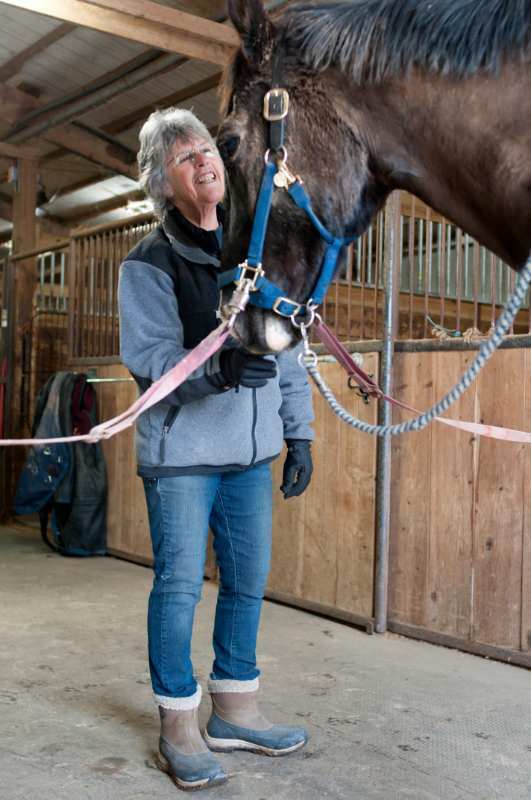 Darenth is one of Carroll County’s eight Horse Discovery Centers, a new program of the state equestrian community that encourages public interaction with horses. 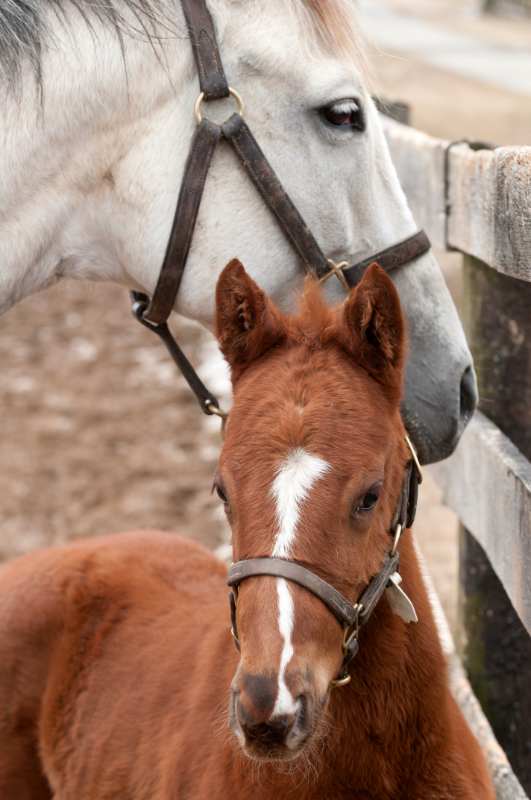 State-certified Horse Discovery Centers are located in 15 Maryland counties. Statewide, there are 38 stables. Dawson said regular exposure to horses is important for the community because there is a stigma surrounding horses. Some may consider horse activities to be too expensive or believe horse-related activities require too much physical stamina. Darenth said she encourages interested individuals to “have a go at it” before deciding it’s not for them. Formal lessons at Darenth Farm offer more than a good time. Dawson said riders can expect to build confidence and gain a range of useful skills. Riding lessons also provide life lessons in responsibility, especially for children. Riders arrive early for lessons to prepare and brush the horse. After the lesson, they put away the saddle, groom the horse again, or add blankets in cold weather. 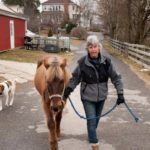 Jeanine Holtsberg is owner and head trainer at Hope Floats Equestrian, which is situated on 17 acres in Taneytown. She provides training and instruction in classical dressage. Dressage is a form of riding that emphasizes riding in harmony with a horse, using specific skills that are a standard for the dressage equestrian art form. 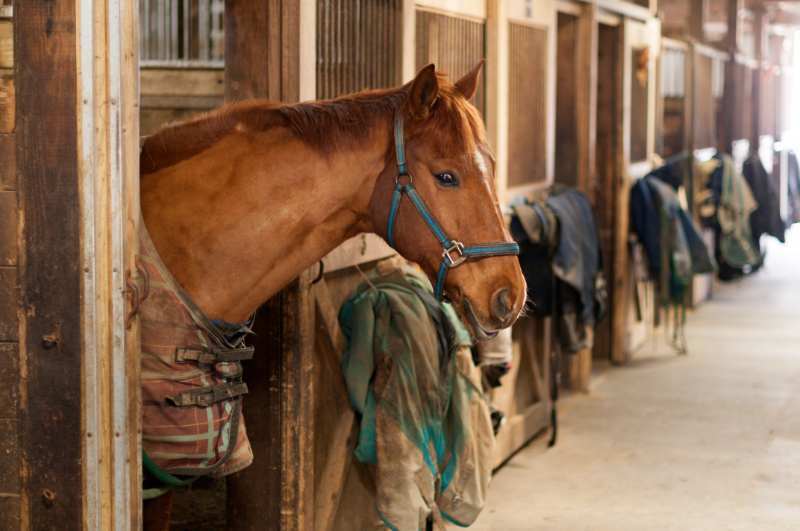 The full-care horse boarding, training and riding stable serves adult riders and their horses. Some riders at Hope Floats are working to seriously develop their competition skills and technique, others are just happy to have their horses at a facility that is known for quality horse care and training. Holtsberg is a dressage expert who also competes at the national level. She has earned the United States Dressage Federation bronze medal and is working with an Olympic trainer in an effort to earn a silver medal. USDF awards are based on the quality of a horse’s performance as demonstrated by scores earned during the competition year. Owners of Full Moon Farm in Finksburg, Karen and Stephen Fulton, have experienced the joy of competition through the eyes of their daughters Grace, 20, and Savannah, aka “Woodge,” 23. Full Moon Farm is a family-owned and -operated full-service equine facility offering lessons, training, boarding and farrier services. Grace and Savannah grew up loving horses and have now both become serious competitive riders. 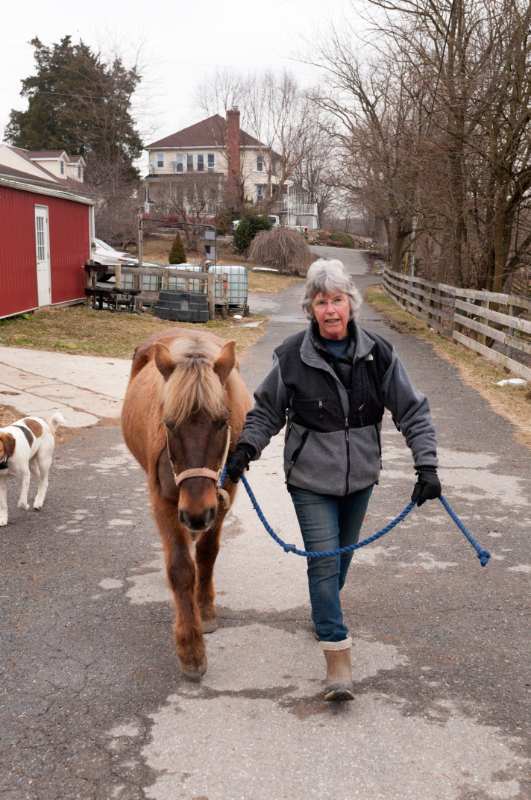 “You never know where your children will end up,” said Karen, who fondly remembers her daughters riding ponies as youngsters and falling in love with horses for the first time. “They had goals and dreams. We had family and friends who encouraged them to become riders, and to keep horses close to their hearts, no matter where life led them,” said Karen. Grace, a student at the University of South Carolina-Aiken, recently completed the highest advanced level of “eventing,” a three-phase Olympic-style sport, at Pine Top in Georgia. Savannah recently won a $45,000 Wilton Fair Fund grant from the United States Eventing Association. This grant will fund her travel overseas to train with European professionals. 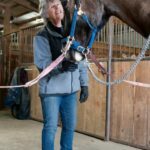 Local farmers and trainers say that horses will forever be a part of the fabric of the community, continuing to offer economic, recreational, competitive and therapeutic benefits. Anyone who has spent time with the beautiful beasts can attest to the fact that horses can impact riders in powerful, personal ways. Sharon Dawson of Darenth Farm, Mount Airy with a Belgium draft horse named D-Day. 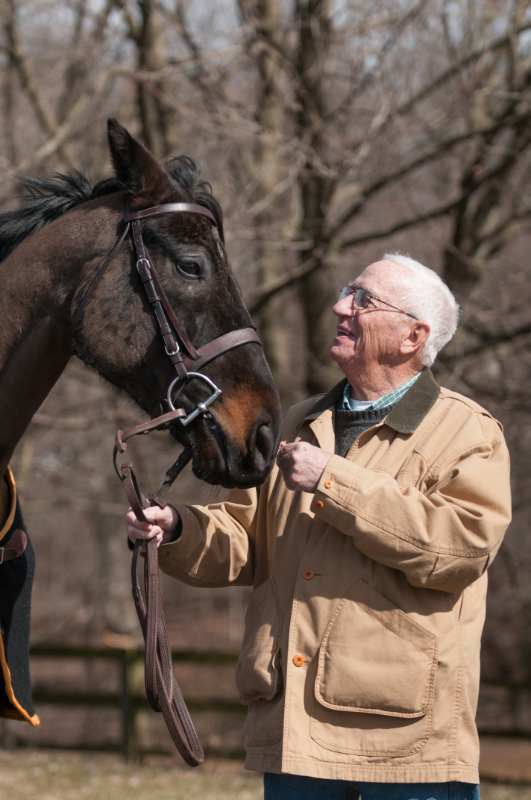 Bob Shirley with Louie, an 8-year-old thoroughbred. Sharon Dawson, Darenth Farm, walks with Duke. A quarterhorse named Buckshot at Darenth Farms. 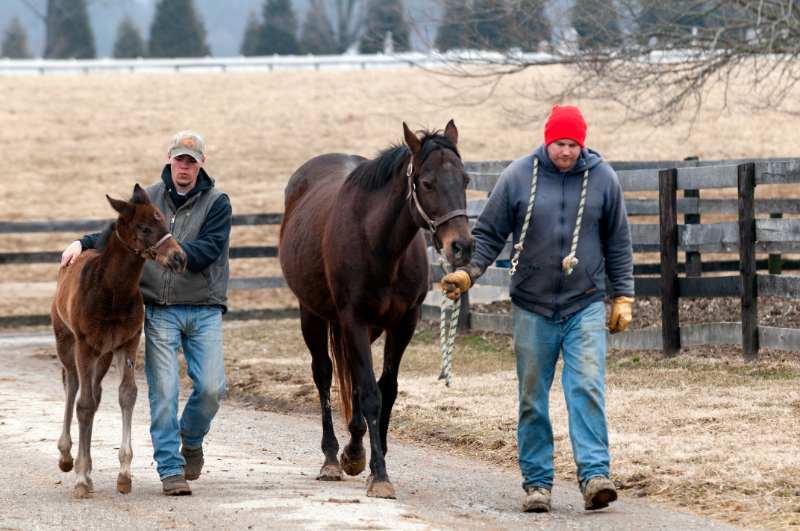 Jimmy Wagner with foal, and Britt Steele with mother, walk horses to the barn.